Hippocrates was a brilliant man. Food can help or food can harm…which do you choose? 6-weeks ago, my husband and I went “vegan” (along with my mom, then eventually my dad too!). I say “vegan” because that word has such bad connotations, but it’s what most people know to mean, no animal products. The preferable term is “Whole Food Plant Based”, but not many people have heard of that. The difference is that “Whole Food Plant Based” is narrowing down the vegan diet to foods that are in their natural form, not highly processed and from plants. Technically, Oreos, Potato Chips and Coke are vegan, but that, of course, would not constitute a healthy diet. Oreos, Potato Chips and Coke are not whole foods and they’re all highly processed, so, they would not be a part of a WFPB diet. I know the power of food. Suffering from migraines and eczema and actually healing my body with foods, I understand the importance of what’s on the end of your fork. What you put in your body is as important as what you leave out. Stayed tuned for future posts on my journeys to healing! I love research and scientific information. I love documentaries on health and nutrition. Knowledge is power and I believe in having a lot of it. So, when we came across the documentary What the Health on Netflix, I was really excited to watch it. It was shocking. Not only because we are ruining our planet by raising so much livestock, or because of the inhumane, cruel treatment of the poor animals that end up on our plates, but also because of the corruption of leading health organization, the government, Big Pharma and agribusiness. I wanted to learn more, so we binge watched more documentaries: Eating You Alive, Forks Over Knives and Vegan Everyday Stories. They all had the same basic premise: animal protein is not health promoting, corruption of our system, inhumane treatment of animals and the detrimental effects that agribusiness has on our environment. This led me to read the book, How Not to Die by Dr. Michael Greger, and watch videos on his website, www.nutritionfacts.org. With all of this scientifically based information, it all started making so much sense. Because of my eczema, we had already eliminated most of the animal protein we were eating. This time last year, we were having animal protein at least three times a day, then we reduced down to twice a day, then eventually, only once a day. I had researched how animal protein was acidic and inflammatory to your body, and with an inflammatory condition like eczema, I figured that cutting back was a good idea. After adding all of this new information to my knowledge toolbox, we went full-on vegan and haven’t looked back. I also had an epiphany. Ever since I was a small child, I’ve always had a profound love of animals…any living beings, really. I’ve always been the kind of person that catches the spider in a glass, then carefully takes it outside rather than just squishing it. After witnessing the treatment these animals endure, it turned on a light bulb that really made me question why I had been eating the very beings that I so love. Like most everyone else, I was culturally and socially conditioned to not make the connection between what was on my plate and what it used to be. I felt so guilty and ashamed. The first Yama of the Yoga Sutras is ahimsa, translated as: nonviolence. Being a yoga instructor, I know this. But, by eating meat, I was condoning the violent treatment of those poor animals. It may have taken 35 years for that awareness to slap me in the face and open my eyes, but I’m certainly glad that it did. For me, there’s no turning back… I intend on fully practicing ahimsa without blinders on. I already feeling like I’m making a difference by not voting for violence with my dollars. Of course, we’ve encountered the very common questions… “Where do you get your protein?” “Where do you get your calcium?” The same place that the biggest, strongest herbivores like cows, horses and elephants get theirs… PLANTS! Protein is found in abundance in the plant world, just like calcium. I mean, just look at these poor malnourished vegans, lol. For us, we have loved the switch. Typically, we had a rotation of about 6 or 7 meals that we would have all of the time. Since we’ve gone plant based, I haven’t made the same thing twice! You try things you would have never tried before. It opens all of these possibilities and it’s been quite fun. I also sleep better, have more energy, my skin continues to clear, I’ve had less knee pain, and the list goes on. There’s no question that my body prefers the plant based lifestyle. We finally convinced my dad a few weeks ago to join us on this journey… He recently went through surgery to remove a massive tumor from his colon. In my studies, it has been found that animal protein and processed foods are the leading contributors to colon cancer. Luckily his tumor had not spread, so he got a second chance. We felt that he should make the most of it by taking better care of himself and not indulging in the very things that contributed to his cancer in the first place. Plant based diets have been scientifically proven to REVERSE the number one killer in America, which is heart disease. (Check out Dr. Esselstyn) That is powerful! If simply changing your diet can prevent and reverse the leading killer in America, then you must be able to see why more organizations aren’t promoting this change. Money. Plain and simple. Doctors, hospitals, Big Pharma & health organizations don’t profit from you being healthy. They profit from sick people… If they can keep you just sick enough to keep coming back for medicine after medicine and procedures and surgeries, then they keep making their mega dollars, all the while, the cure for your ailment was probably right there in the produce department. It’s all so mind-boggling to me that our system is set up that way, but, it’s the sad truth. I know that nutrition is so confusing. One day you’ll read that ______ is good for you. The next day you read it’s bad for you. Ahhhhh! So what do you do?!?!?! For one, you must consider the source. If a study is funded by say, the beef industry, then of course their funded study will have favorable results. Dr. Greger put it best… He says that if all of these industries can keep you just confused enough to the point you don’t know what’s right and what’s not, then you’ll eventually just throw up your hands in frustration and decide to just do what you want to do. Most everyone will tell you that they don’t eat enough vegetables or that they know they need to eat more. Why is that? Because most everyone will agree that vegetables are what’s healthy for you. If you know that, then just eat more… it’s that simple and it might even make you feel better! What you eat now is going to affect you later in life. Why wait until you have a health problem to make a healthy change? It is not my intention to bash anyone that eats a certain way, or to try and force anyone into my way of thinking. Each to their own… Everyone has their own reasons for doing what they do and I certainly respect that, just as I hope you respect my decision for doing what I do. My goal is simply to share my own personal experiences and knowledge I’ve obtained through research, then you may do with it what you will. Hopefully, September will be bringing cooler temperatures! 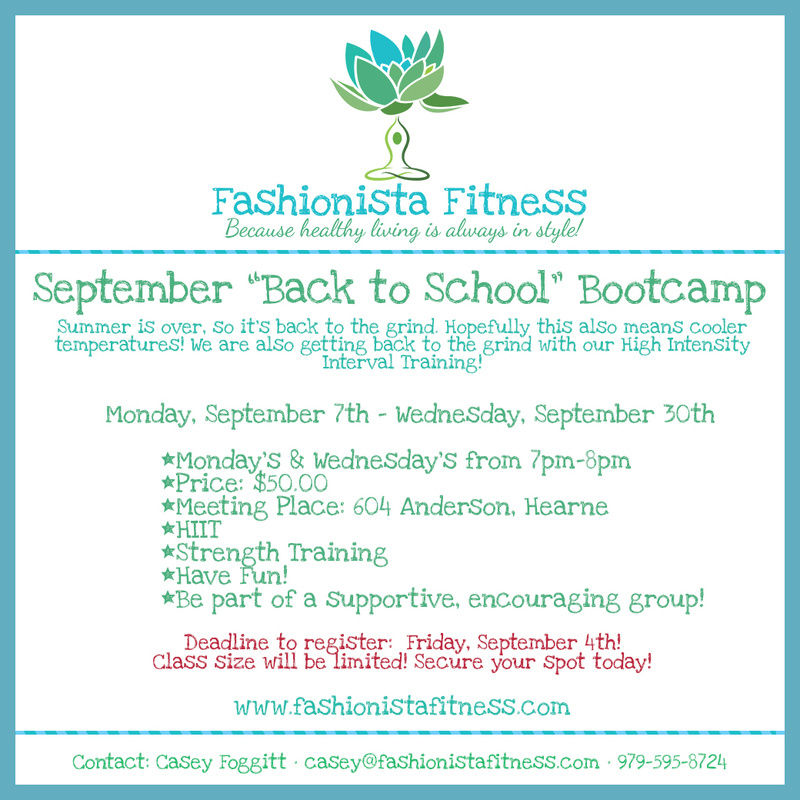 Since the triple digits have seemed to subside, we are getting back to the grind and ramping up our HIIT once again. We are also going to incorporate more nutrition into our sessions this month. To help, I’ve created the following Daily Food Log, as well as some healthy eating tips to use as tools for “Operation Clean Eating”! 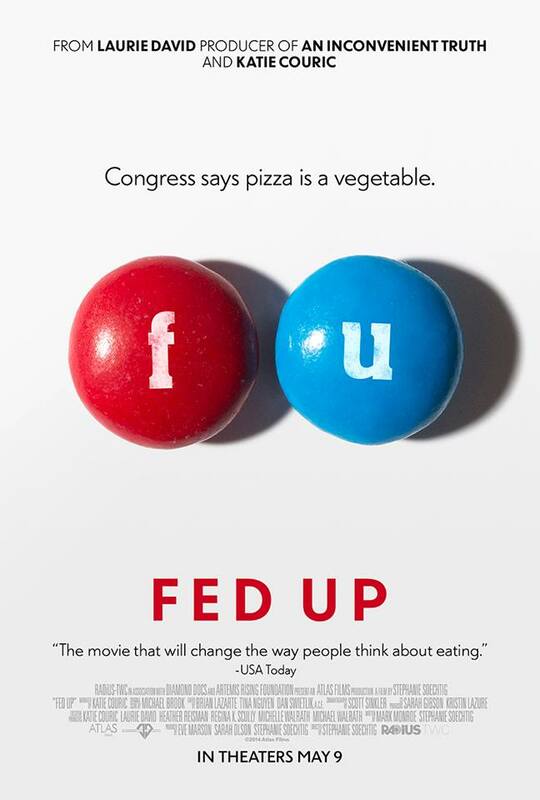 Fed Up is a great documentary exploring the American obesity epidemic, and how the food industry is only aggravating the problem. Did you know that Congress considers pizza a vegetable in school lunches? Me either! How crazy is that? Did you know that in 1980, there were zero children diagnosed with type 2 diabetes, but that in 2010, there have been over 51,000 children diagnosed? That’s a frightening statistic! I was shocked and angered by what I learned from the film. Watch it! Then, take action! Visit the website: http://www.fedupmovie.com to buy the movie, learn valuable information, or to find out how you can help with this growing epidemic! You Can’t Out-Exercise a Bad Diet. ​When trying to lose weight, exercise is only half the battle. The other half is found in the kitchen. If your eating habits are not so great, then you are sabotaging all of the hard work you’ve been doing exercising. This will only lead to disappointment and despair because you’ve been working out so hard, but, you just aren’t seeing the results you thought you would. Taking a look at the above chart, you will see that it takes a LOT of exercise, just to burn off the calories of a seemingly small meal or snack. I don’t know about you, but, I don’t love soda enough to do almost an hour of lunges for each one! And, that glazed donut in the break room is not worth 88 minutes of crunches to me…yikes! One pound of fat is equal to 3,500 calories, therefore; to lose one pound a week, you need a deficit of 500 calories a day. Take a look at your daily habits to see where you can make some improvements. Do you drink 4 sodas a day? If so, you could replace those with water, and you are well over your 500 calorie deficit! The next time you are toying with the notion of getting that large order of French fries, ask yourself if you really want to do 524 burpees. Chances are, the answer is no, then you just saved yourself 500 calories and the torture of everyone’s most dreaded exercise!